Cheri joined Cleary Insurance in October 2017. She has over 37 years of commercial insurance experience. 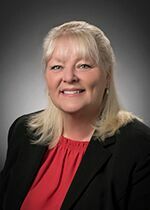 Cheri earned her Certified Insurance Service Representative (CISR) designation in 1995 and has been a licensed insurance producer since 1997. In her spare time Cheri enjoys volunteering for the Boston Bruins Foundation and cheering for her favorite hockey team!